That’s right! 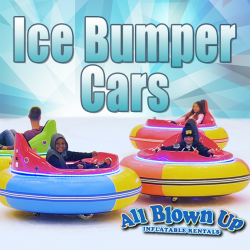 Ice Bumper Cars are here, and they’re only available through All Blown Up Inflatable Rentals, Inc.! These cars will zoom around on the ice; moving forward, backward and sideways; and they have a 360-degree turn radius! Bump your friends and send them twirling across the ice! Ice Bumper Cars can be used on indoor or outdoor ice rinks, and include 4 Ice Bumper Cars.